The overgrown trees, numerous cenotaphs, beautifully carved spires and the remains of the abandoned fort on the rocky hill in Mandore surrounded by lush green garden conspired to provide a perfect contrast to the busy streets just outside the gates. Mandore which was earlier named Mandavyapura has a mention in the ancient Hindu Scripture Ramayana. As per the legend, Ravana, the demon king of Lanka who abducted Sita defying Rama married Mandodari, the princess of Mandavyapura. Mandore was the capital of Parihar Rajputs who ruled the region during the 6th century. To defend Mandore against the attack of Sultanate of Delhi, the Parihars got into a marital alliance with Rao Chunda, the King of the Rathore clan. Mandore was presented as a gift to the Rathores during the wedding. Thus Mandore became the seat of power for Rathores. As the successors of Rao Chunda expanded the kingdom of Marwar, they realized that the old fort of Mandore was not good enough to defend them from the external attacks. Thus Rao Jodha, the grandson of Rao Chunda laid a foundation for the construction of the Mehrangarh fort on the rocky hill of Bakurcheeria located 6 miles away from Mandore. The city within the Mehrangarh fort got its name Jodhpur from its founder. As Jodhpur emerged as the new seat of power in Thar region, people from Mandore migrated to the new capital leaving the city of Mandore to gradually fall into decay. However, the old capital of Mandore continued to be the final resting ground of the late rulers of Marwar until 1873 AD post which the royal cremation ground was shifted to a small hill close to Mehrangarh fort. There are numerous cenotaphs in Mandore that are spread across the entire garden. 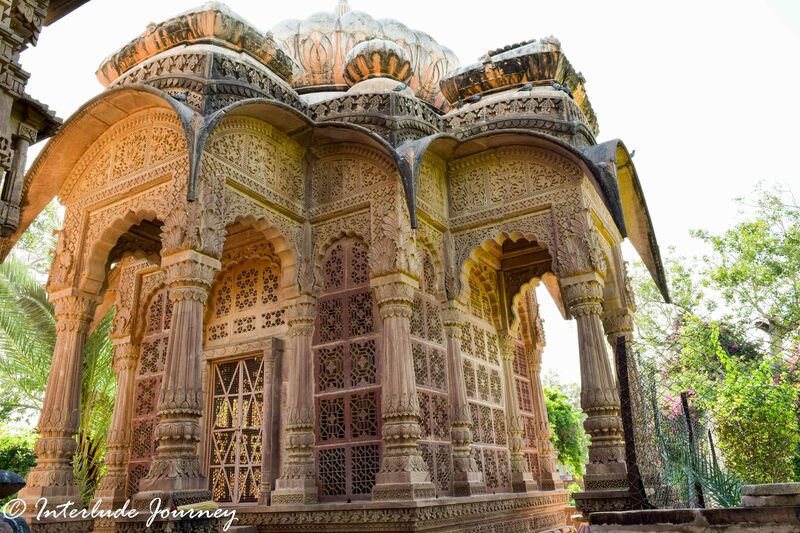 While some are constructed in the usual chhatri style, some are built in extreme grandeur with beautiful carvings. The ones that caught us spellbound were the cenotaphs of Maharaja Ajit Singh and Maharaja Jaswant Singh. The cenotaph of Maharaja Ajit Singh stands out as an architectural wonder with its three-storeyed spires constructed on a huge edifice. The walls and pillars are decked up with beautiful carvings made by combining Buddhist and Jain elements. Just opposite to the cenotaph of Maharaja Ajit Singh is the cenotaph of Maharaja Jaswant Singh which consists of a vast pavilion and a huge dome built on an octagonal base and supported by beautifully carved pillars. A short walk behind the cenotaphs of Maharaja Ajit Singh and Maharaja Jaswant Singh lead to the rocky hill which has the abandoned fort built by the Parihara Kings during the 6th century. Most part of the fort is in decay now owing to lack of maintenance. The rocky terrain of the hills also house some cenotaphs built for the Rathore queens. 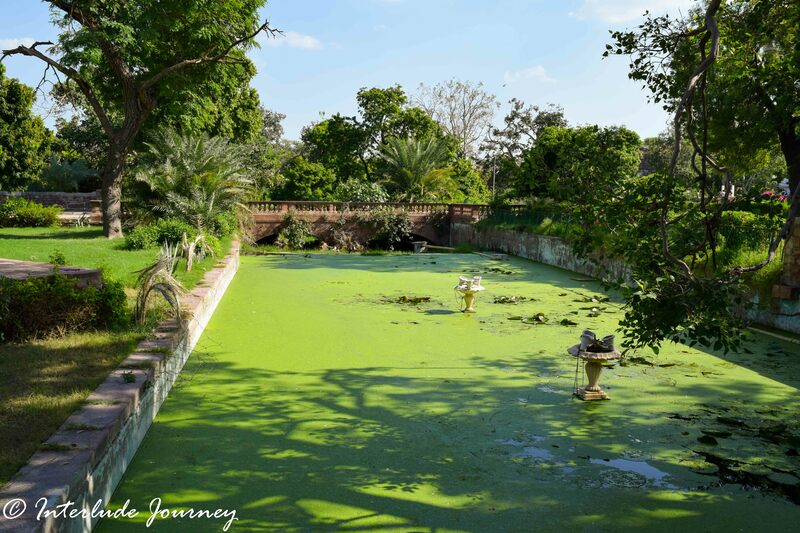 What greets us today as we enter this centuries old marvel is a huge garden with overgrown trees and playful langurs. The water canals surrounding the cenotaphs are in complete dismay covered with algae. The beautiful water fountains and bird baths located amidst the water canals are filled with bird poop. However, most of the cenotaphs and the carvings are very well preserved. It was surprising to see that such beautiful monuments had no visitors, quite contrary to Mehrangarh fort located just 9 km away which was brimming with tourist herds. What came as a bigger surprise was the fact that there was no entry ticket for such a beautiful monument and there were no guides available to help the visitors. It is quite true that not all beautiful things in life come for a price. If you are someone like us with a desire to discover the architectural wonders and love to avoid the crowd, you should make a visit to the Madore gardens. However, make sure you do your bit of reading and research before heading to Mandore because it is highly unlikely that you would get a guide to help you around at Mandore. Mandore is located very close to Jodhpur and is well connected by road. The best time to visit Mandore is post-monsoons when the garden is lush green and the temperature is moderate. Mandore is a photographers paradise. Don’t forget to carry a good camera along with you during your visit. Beware of langurs in the garden. Wear comfortable clothes and footwear as there is a lot of walking involved. It takes around 2 hr to see around mandore gardens. It might take even more if you are an avid photographer. So, plan your itinerary accordingly. No restaurants are available inside the gardens. Carry adequate water and some snacks while going there. Thank you for a wonderful blog! It’s highly informative laced with brilliant pictures! These carvings are incredible! I haven’t seen anything like this before, but I would love to see them in person. I’m sure pictures can’t do them justice, but yours are beautiful! Very true Ashlyn. It is not possible to capture the grandeur of the place in pictures. You need to visit to experience it. Laura, you should plan a visit to Rajasthan in India to experience royalty. It is truly a dreamland. Wow! The intricate designs on the architecture is mind blowing. I was lost in those carvings. What a beautiful masterpiece. The surrounding is so clean and green, a breath of fresh air is all you need with those amazing carvings on the monument. A fit resting place for the departed. I was blown away by the detailed sculpture here and at the same time I felt these monuments are neglected bit. You have captured them so well! Indeed a photographer’s paradise as you mentioned. Couldn’t agree more about the place being a photographers paradise. The best part, it is not plagued by visitors and hence getting the perfect shot with no disturbances is very much possible. Oh my goodness, check out all that detail in the buildings. I think I would get a sore neck from staring at them. Definitely a place I would visit and explore. Also…what are langurs?? Wow would you look at the intricate carvings and designs of those cenotaphs. And wow I learned another word haha.. I didn’t know about cenotaph until now. They are pretty grand when it comes to paying tibute to the dead I must say. The intricate designs of the buildings blew my mind away. Can I live here even for just a day? (Kidding!) But hey, these are part of the world’s rich culture and history! Can’t wait to visit this soon! I have heard alot about the gods and goddess and history about India. this one certainly looks amazing. I don’t understand how come people around the world couldn’t explore such a beautiful places like this. Must visit. Very true Sophie. We hope Mandore gets the attention it deserves. Lovely pictures and information on Mandore Garden. Its not a very popular tourist attraction since Mehrangarh takes away all the attention. I have visited this place many years ago, so this post refreshed my memory. Thanks for sharing! We visited the Mandore Gardens in November last year and were awed by the grandeur of the architecture. We had visited quite a few cenotaphs across Rajasthan but the ones in Mandore have their own charm and splendor. It’s definitely a pity to watch those wonderful monuments in the abandoned state. Very true Rashmi and Chalukya. The cenotaphs at Mandore are quite unique and artistic. Wow! This architecture is simply amazing! I’d love to bring my camera here with me and shoot away! I hope to get there one day! We hope you get to visit India soon! That short history gives a much needed perspective to my knowledge of Rajasthan and Jodhpur. The cenotaphs are simply gorgeous. Reminds you of the power an glory of the Indian royalty. wooow… my list for places to visit in India is going long and long… and just after reading reading this post Mandore gardens is added to my list. Your photos are enough to convince me plus the history are very well interesting. These architectures always blow me away. Definitely a photographer’s paradise. So beautiful, so intricate. And the story behind these kingdoms is so interesting. Imagine, a whole kingdom was given as a wedding gift!! I will definitely include Mandore in my next trip to this region. I had no idea of the history of Mandore and Johdpur. The detail of the Maharaja Jaswant Singh is amazing, I would love to see close up photos of it also, so much detail to photograph. I think it would take me more than 2 hours, there seems so much detail to photograph! The carvings and sculptures are all so intricate. You have captured them beautifully in the photos, but I’m sure there’s nothing quite like visiting. Definitely need to consider visiting Mandore. I must admit I had never heard of Mandore until this beautiful post. The gardens are so lush and green and the architectural intricate and ornate! I love all the old buildings in India. They are so interesting. We really do not have spectacular ones like these in the UK. I need to spend more time in the North of India. I am going there soon for a wedding so it would be lovely to head up north afterwards. Your tips at the end are very useful. Thank you. Madore Gardens is indeed an architectural wonder! I also live that it has rich history that adds to its appeal! Such beautiful architecture. We did not know about this place else would have loved to visit this place when we visited Mehrangarh fort. Those intricate carvings look so amazing. Beautiful pictures and a great write-up. Cenotaphs look beautiful and intricate. I have never heard about this place near Jodhpur. But I don’t understand why these heritages are not maintained in India. And why tickets are not there. Your pictures are awesome. It sounds like Mandore has an incredible rich history. Those carvings on the buildings are well detailed. This looks like a wonderful plce to explore. I had never heard of Mehrangarh in Jodhpur. I will definitely keep this in mind when I visit Jodhpur. All photographs are so gorgeous and the cenotaphs are so intricate. The architecture of the building from Mandore gardens is so beautiful! I am always amazed on how stunning the Indian heritage is and how these building have stood up the passing of time. I have been to Jodhpur but unfortunately I only had one day scheduled there so I didn’t got a chance to visit the Mandore gardens as well. I wish I did though. Mandore Garden seems to be such a fascinating place 🙂 I must keep this in mind when I visit India again. What an amazing architecture, love it! Loved these photographs. It is one place near Jodhpur that many people tend to skip. I visited it ages ago. I did not even have a proper camera back then and was not yet writing about travels. I always wished I had better pictures from this place. Wow. I’ve read quite a bit of Indian history but I’ve never come across this. This is wonderful. I must say, the cenotaphs are so beautiful.